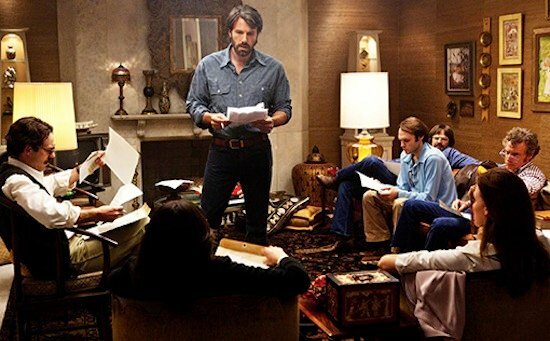 Ben Affleck’s excellent thriller Argo does what all films based upon ‘true stories’ should: Find a historical tale very few are familiar with, and tell it with the gusto of great fiction. I imagine inspiration was not hard to come by, for this particular story could not be any more cinematic if it were fictitious. At the outset of the 1979 Iranian hostage crisis, six Americans escape and take refuge at the Canadian ambassador’s home in Tehran. CIA operatives must race against the clock to pull these diplomats out before the revolutionary guard finds out who and where they are. On short notice and in the midst of the Iranian revolution, options are severely limited. The Department of State suggests sending the diplomats bikes and letting them ride to the border. CIA extraction specialist Tony Mendez (Ben Affleck) has a better idea: Pretend the diplomats are members of a movie crew, scouting locations for an outlandish science-fiction film, and use the cover to get them onto a commercial flight through ordinary means. Crazy, no? Mendez had to coordinate with a real-life Oscar winning make-up artist, John Chambers (John Goodman), who organized contacts in Hollywood, finding a fake director and creating a fake production studio. An unwanted sci-fi script was found and purchased, articles were written about the production in Variety, and posters were distributed. Even the name of the fake movie, ‘Argo,’ had a dramatic flair. The name references the ship of Greek mythology that Jason and his Argonauts sailed from Iolcos to find the Golden Fleece, a treacherous mission overseen by goddess Hera. The American undercover ‘Argo’ mission was similarly impossible, and just as susceptible to moments of divine intervention. It is the kind of story that absolutely deserves to be a movie, and Affleck proves himself the perfect man for the job. Argo is a handsome, taut, tightly woven tapestry of tension that holds one’s stomach in knots even as one suspects that, since this is a true story, things must have turned out fine. That is the mark of spectacular filmmaking, and the clearest sign of Affleck’s directorial talent is his ability to assemble and creatively enable a truly remarkable crew. Chris Terrio’s script is outstanding, moving through complex exposition briskly and without a hint of dryness; cinematographer Rodrigo Prieto’s work is measured and reserved, effectively atmospheric without calling attention to itself; the lovely, understated musical score by Alexandre Desplat works in flawless harmony with the visuals; Sharon Seymour’s intensely tangible production design evokes the period with ease; and William Goldenberg’s editing is rapturous, mastering various tempos with expert precision for maximum tension. If Affleck has established himself as one of American cinema’s single most exciting directors, he’s done so by understanding that filmmaking is not about ego, but teamwork, and Argo is the clearest distillation of that ethos to date. It even extends to the casting. Though Affleck has given himself the central role, Agent Mendez is one of the film’s least flashy parts, and as an actor, Affleck’s work is unlikely to be discussed to the same degree as his cast-mates. That’s by design, but don’t mistake Affleck’s soft nuance for wooden performing. There’s a very clear purpose in keeping Mendez as opaque as Affleck does. His work illustrates a man whose soul is in turmoil, a covert operative forced to internalize feelings he would, in another life, probably wear on his sleeves. Argo has very little time for character work, but I felt sufficiently moved by Mendez’s moral arc, which culminates in a stirring moment of emotional and intellectual dénouement. He is unlikely to win any awards for the part, but it’s Affleck’s mastery of minimalist performing that makes the character click. Still, it’s the supporting cast that gets to shine, and Affleck has assembled one hell of an ensemble, filled with veteran character actors like Bryan Cranston, John Goodman, Alan Arkin, Kyle Chandler, Victor Garber, and plenty of less familiar but equally talented names. Few performers get more than two or three scenes to shine, but each makes the most of their limited spotlight, crafting vivid, endearing characters that seem to extend beyond the screen. Cranston, in particular, gets the applause worthy, show stopping line of the evening, the kind that audiences will remember well after the lights come up. 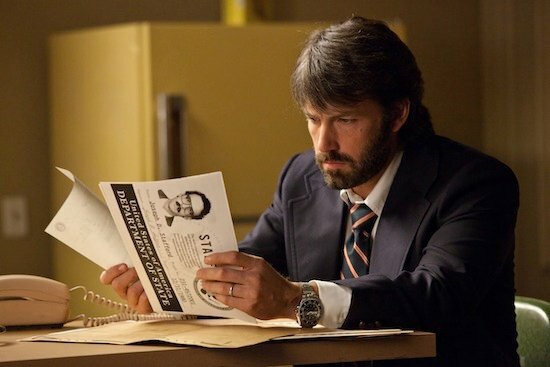 Though Argo contains some meaningful and timely analysis of America’s relationship with the Middle East – which is inseparably linked to the film’s discussion of action-based morality – I do not find it quite as emotionally or intellectually stimulating as Affleck’s earlier works, Gone Baby Gone and The Town. It is a simple matter of taste, as my interests always lean towards the character driven, and Argo, while not objectively weaker in any noticeable way, is much more preoccupied with plot. It is a straightforward, crowd-pleasing thriller, and while there’s nothing wrong with that, those expecting another character epic may want to adjust expectations accordingly. Argo is, in any case, absolutely worth seeing, especially considering what a big part of the year-end conversation it is destined to be. Affleck has taken an unbelievable slice of reality and miraculously improved upon the truth, and the results could hardly be more satisfying.